Home » Uncategorized » Could you use more HOPE in your life? Scripture is clear. The more we know, believe & trust God’s Word & Will in life… the more Hope, Contentment & Joy we will have. If you need more Hope, you probably need more Word. Introducing the Second Annual Recapturing Hope conference at the Potters House Worship Center in Smithland, Kentucky. Each year the Recapturing Hope conference tackles a particular topic of Christian interest and digs deep into the Word to better understand that topic… and in turn, to gain more hope in the process. The conference is free and brings together some of the best Bible teachers. This year the topic of the conference is death and the afterlife. What happens to Christians when they die? How does knowing the truth about these questions give me more hope? 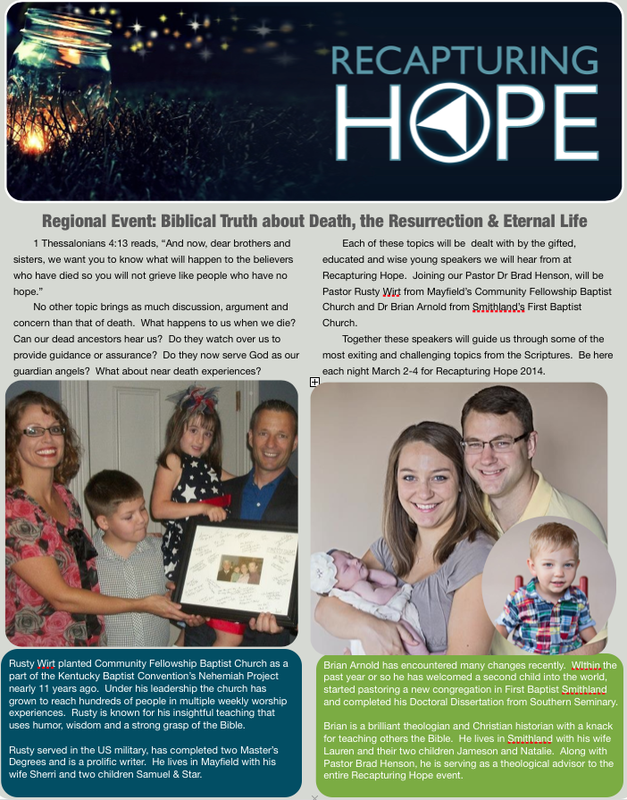 You are wanted and welcome at the Recapturing Hope conference. If you have struggled with the death of someone you love or if you feel the need to prepare for such a struggle, then this conference is for you. March 2-4 at 6:30 pm at the PottersHouseChurch.org. FBC Smithland and the Community Fellowship Baptist Church from Mayfield are also sponsoring churches for this event.